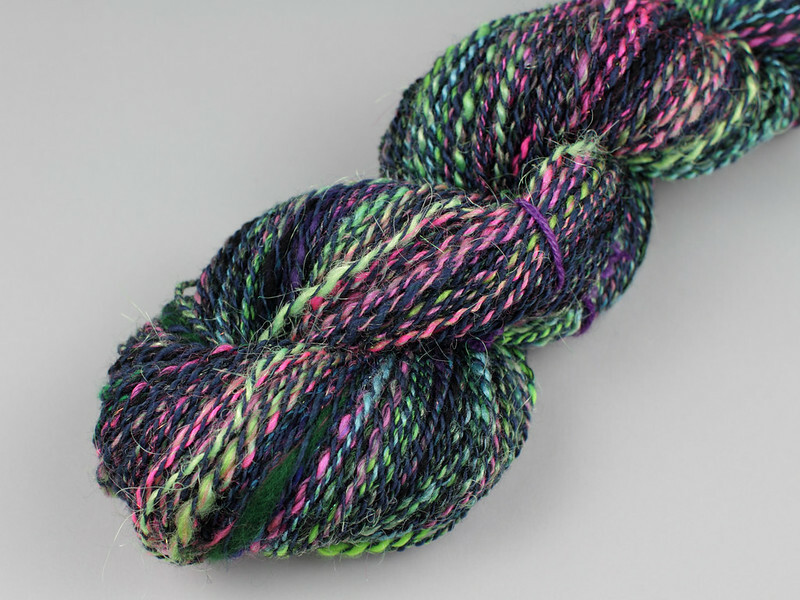 I’ve been spinning for years but it’s not often that I give the wheel much love, or be particularly adventurous with spinning techniques. 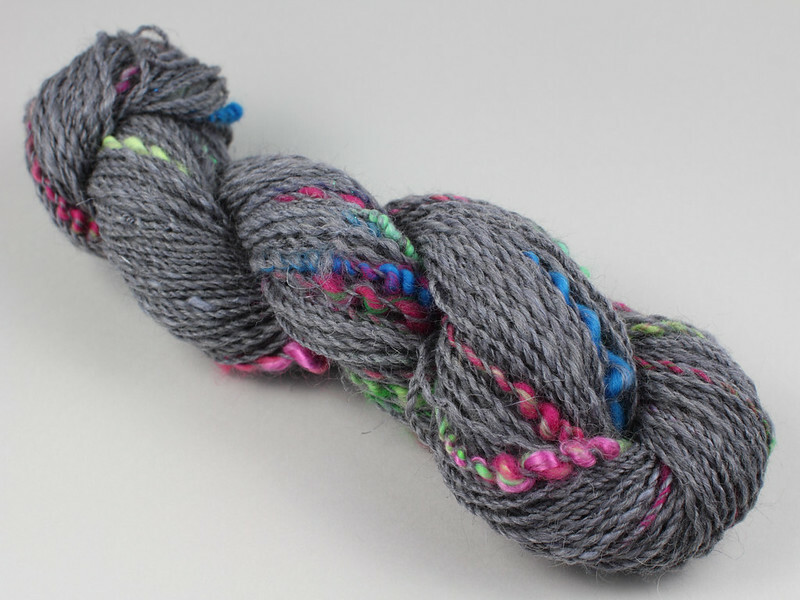 Though I do like a batt of glittery art-fibre, especially those from Spin City. I also like to lurk in the Spin City chat Facebook group and marvel at the beautiful and zany yarns that the talented folks there spin. 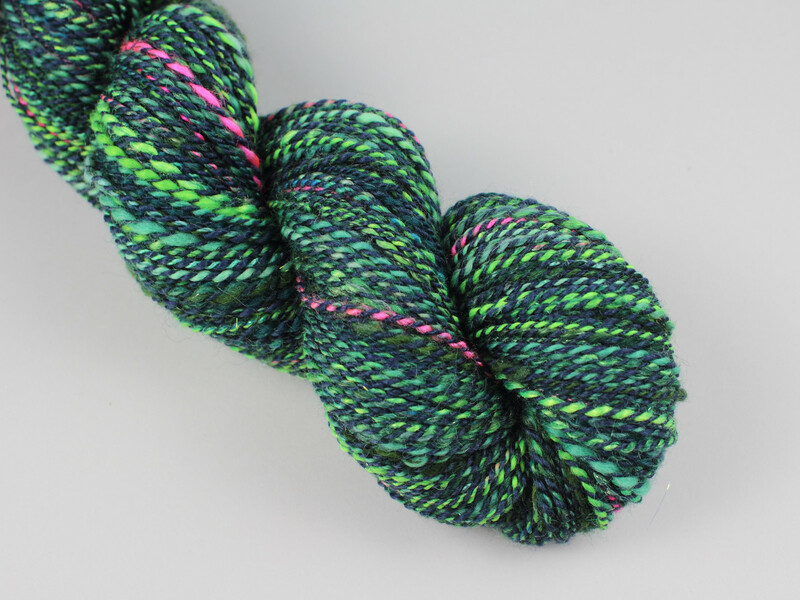 When Louise of Spin City suggested a Northern Lights themed spinalong, I of course had to join in (not least because my daughter’s name is Aurora). Louise put together an optional kit (now sold out) to accompany the spinalong, which I was lucky enough to receive from Santa. 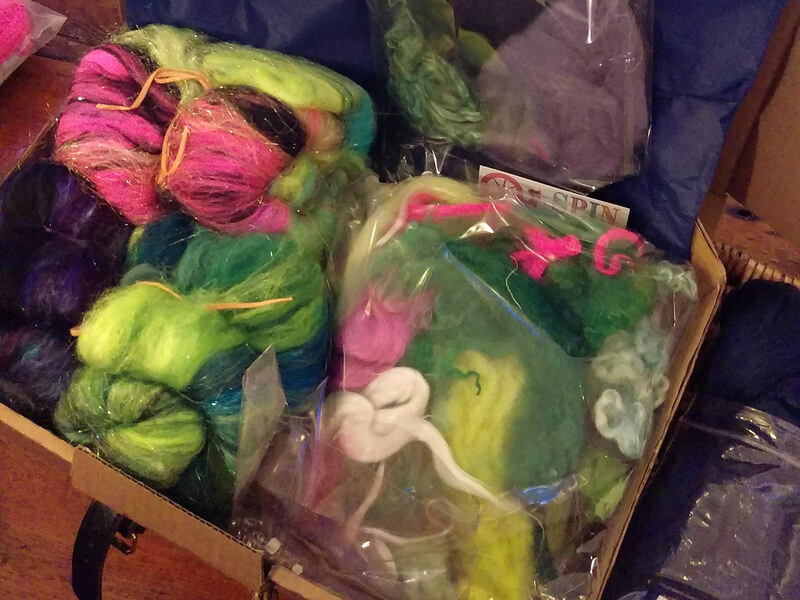 So excited was I about the sheer sparkle of the batts that I failed to take a good photo of the contents before diving in. I only have this awful phone picture that doesn’t do the contents justice at all. 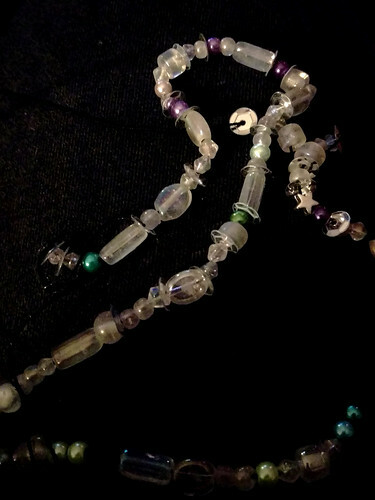 There are loads of goodies here; three 50g mini batts, a bag of locks and fibres, a bag of special bits, a bag of beads and sequins, and some very, very special spinnable fairy lights! I added the bag of dark blue merino/bamboo top on the right. I felt a bit intimidated by all these lovely things and was under pressure to do the kit justice, so I kept it simple for the first skein and spun the pink and green batt fairly fine. 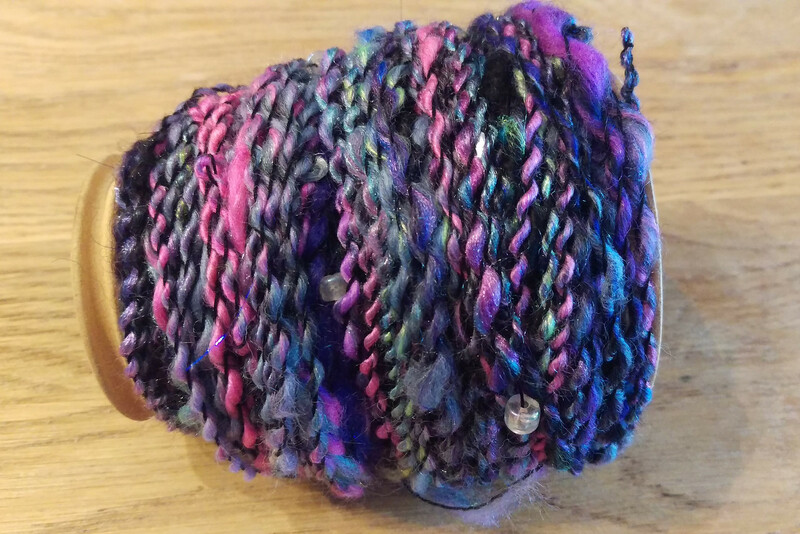 And spun the dark blue fibre to ply it with. The result was very pretty! It came out at something around a DK at 222m/120g. 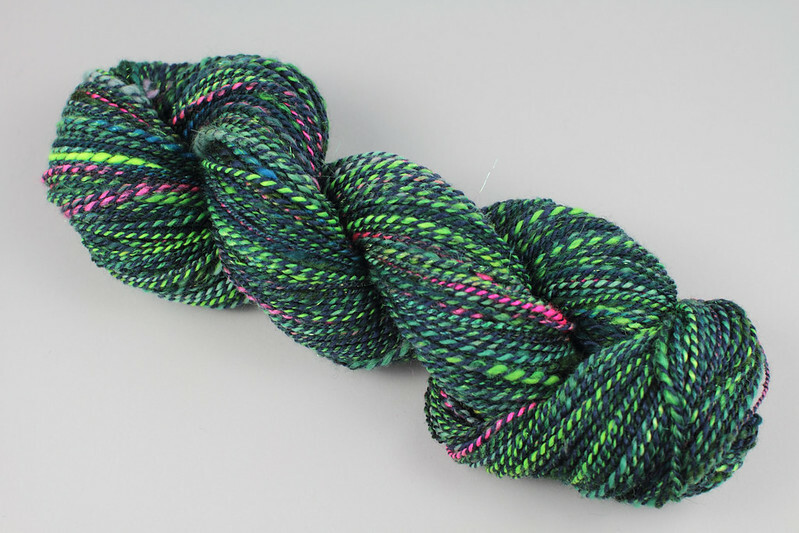 I was very happy with with this and wanted more of it to possibly use for a larger project, so I spun the greenish batt the same way, but mixed in some neon pink fibre from the bag of add-ins in the kit. 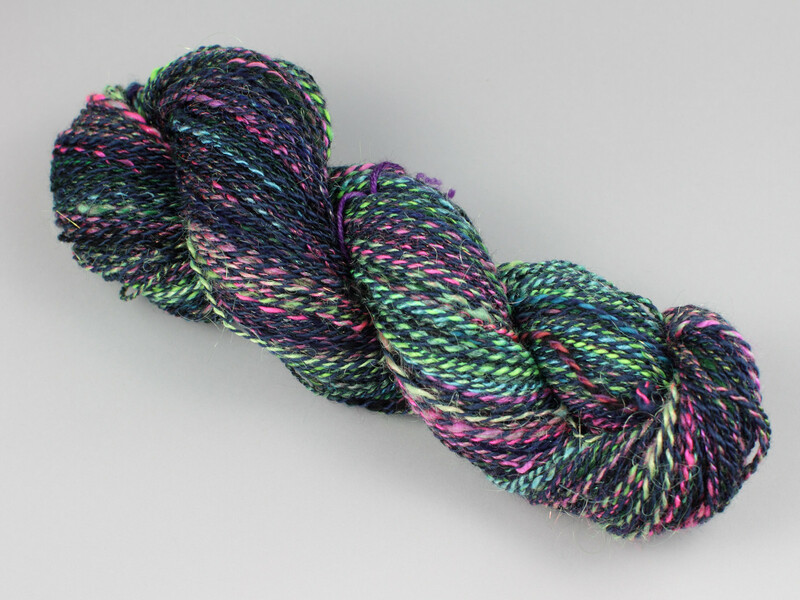 I think this is the best yarn I have ever spun. Those neons really pop against the dark blue. Again, it’s something close to a DK at 92g/166m. One of my aims with taking part in the spinalong was to try out some new techniques and be a little more adventurous. Although I had made some beautiful yarn, I had so far played it very safe. The purple batt, full of dark sparkles and glossy fibres, was crying out to be spun to show off its shine. 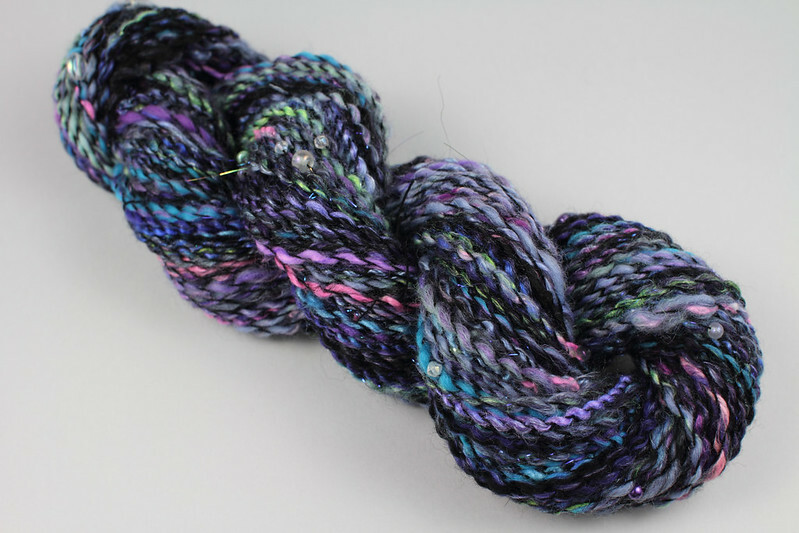 I spun in fairly thick and loosely with the view to it being a singles, but I wasn’t sure it was sturdy enough to stand up to use. 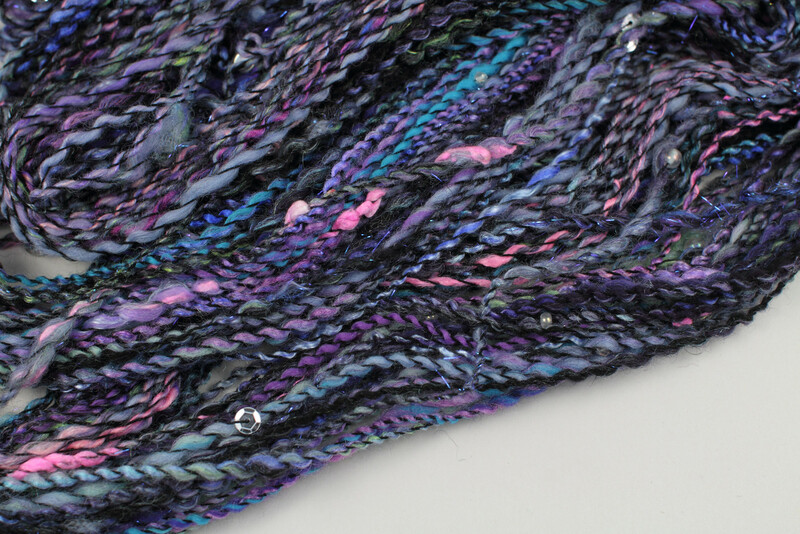 I found some fine black crochet cotton with which to ply it, which I strung with the sequins and beads from the kit (I’d literally never have thought to do this had they not been included). Every few passes I fed a bead along the thread and into the plying zone, which was not nearly as much hassle as I feared. The only difficulty was fitting it all on the bobbin. …and the embellishments take it to the next level. 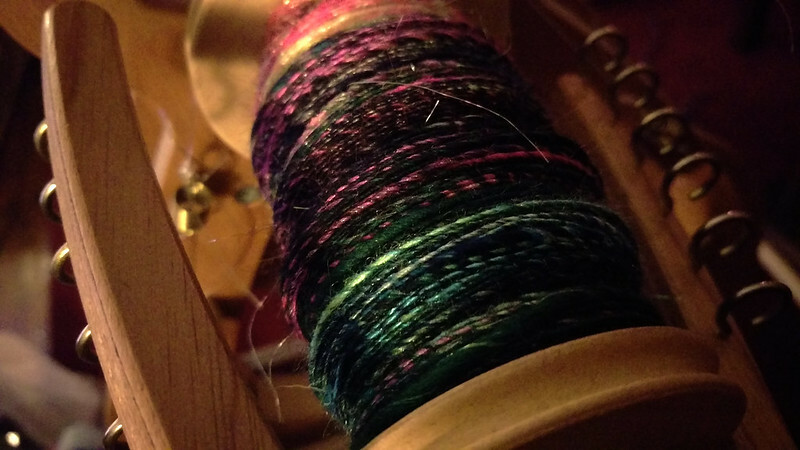 Before starting the spinalong, I felt a certain amount of pressure to spin these beautiful fibres to their full potential. Now that I have, I feel an equally crippling sense that I must put these unique yarns to the best possible use. Please give me your thoughts if suitable projects come to mind! I still had most of a bag of ‘Cloud Fibre’ scraps left over from the kit. 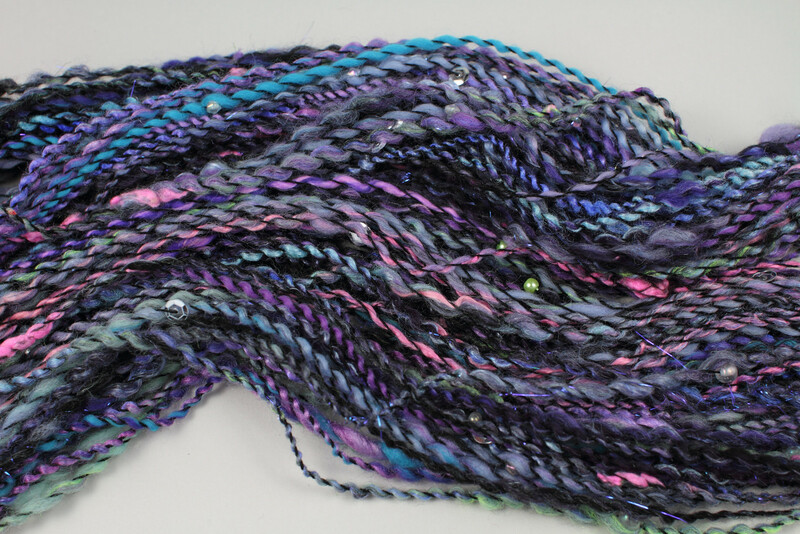 Inspiration struck late in the day about what I should do with them: they became coils in a chunky yarn I spun with a bag of grey Hilltop Cloud blended top, like colourful comets shooting through the sky. 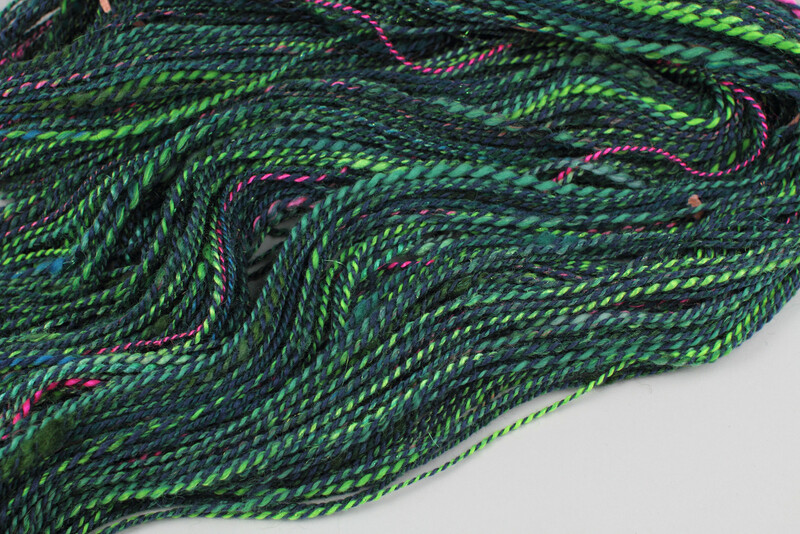 This is only my second attempt at coils, made harder by choosing slippery fibres, and while they’re far from perfect, they were a lot of fun to spin. I’ve really enjoyed this whole spinalong, and I’m very happy to have created yarns I would not have otherwise. I actually have another four art batts in my fibre stash along with some glittery Angelina from the Northern Lights kit. I hope I can keep the momentum up and do something interesting with these. Beautiful and inspiring! 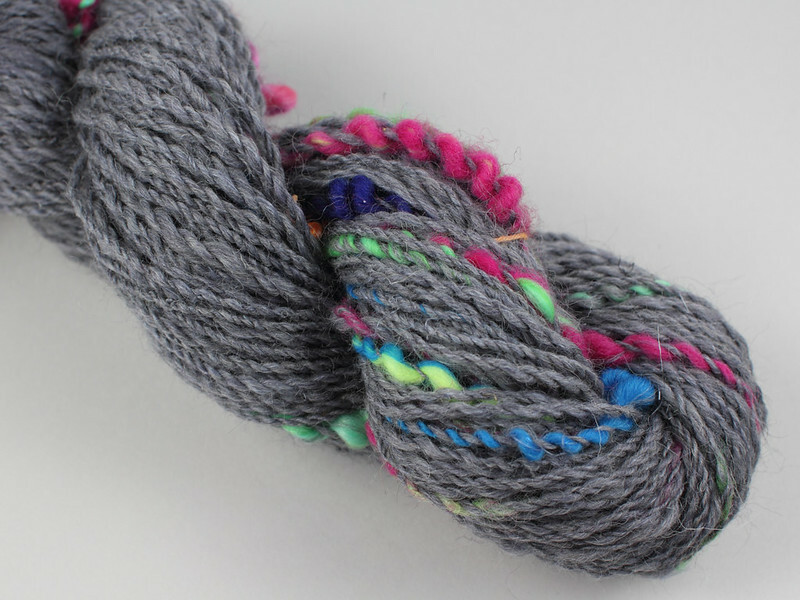 And what fun yarns you’ve made! Intrigued by spinnable fairy lights! I looked for some knittablw ones last year but the only ones I could find had very fine wires that I didn’t think would stand up to knitting, so I can’t wait to see what you do!